From the land of the great ancient Egyptian civilization, the land visited by our Lord and the Holy Family, and from the line of renowned predecessors such as St. Mark the Apostle, St. Athanasius the Apostolic, and St. Cyril the Great, comes the author of the renaissance of the Coptic Orthodox Church: H.H. Pope Shenouda III. A distinguished and prominent religious leader, a profound theologian, a gifted preacher, a talented author, a spiritual father, Pope Shenouda was a man of God his entire life. His Holiness was born Nazeer Gayed on August 3, 1923, to a pious Christian family in Egypt. By the age of 16, H.H. was active in the Sunday school movement, which wrought to enrich Christian Education in the Coptic Orthodox Church. When H.H. graduated from Cairo University, he joined the Coptic Orthodox Seminary, and upon graduation, joined the faculty of the seminary. On July 18, 1954, H.H. chose the solitude of the Egyptian desert and the angelic life of monasticism over everything else, taking the example of St. Anthony the Great. As a monk, and later a monk-priest, His Holiness carried the name of the Christian monk and was known as Fr. Antonious El-Syriani. On November 14, 1971, His Grace Bishop Shenouda was consecrated as His Holiness Pope Shenouda III, the 117th Pope of Alexandria and Patriarch of the See of St. Mark. The unprecedented revival of the Coptic Church toward the second half of the 20th century and the first decade of the 21st century is one of the great historical events of world Christianity. This is directly due to the charismatic and dynamic leadership of His Holiness Pope Shenouda III, who transformed the entire landscape of the Church. Of the many great qualities evident in the distinguished personality of His Holiness Pope Shenouda III, one is most striking: His Holiness is an erudite teacher who has rightly been referred to as the St. John Chrysostom of the 21st century. In 1978, His Holiness was awarded the Browning Institute Prize for the Best Preacher in the World. His Holiness was known for his captivating skill in the use of words, as well as a certain deftness in exposition of the detail and interpretation of Scripture. His weekly sermons in Cairo (regularly attended by 8,000-10,000 people) and biweekly sermons in Alexandria were attended by thousands of people eager to hear and benefit from his nourishing words. The weekly Wednesday sermon was one of the most joyful sights of the Christian world at the beginning of the 21st century. It has no equivalent and no equal either in or outside Egypt. “I shall give you shepherds according to my heart who shall feed you with knowledge and understanding.” (Jeremiah 3:15). These prophetic words are most evident in the edifying preaching and teaching of Pope Shenouda. As a renowned theologian and scriptural scholar, His Holiness was a prolific writer. His Holiness is the author of 123 books on a variety of scriptural, doctrinal and spiritual topics and 28 poems. Some of these poems have become popular Christian hymns sung in our churches. His Holiness was also Editor-in-Chief of the bi-weekly magazine El Keraza. His Holiness Pope Shenouda is well known for his deep commitment to Christian unity. Over the past four decades His Holiness has invested tremendous time and effort to enhance the relationship of the Coptic Orthodox Church with other Churches in three principal areas: theological dialogue, constructing bridges of love, and participation in ecumenical bodies and conferences. His Holiness initiated dialogue with the Eastern Orthodox Churches (1985), the Roman Catholic Church (1973), the Anglican Church (1985), the World Alliance of Reformed Churches (1993) and the Lutheran Church (2005). In recognition of this work, His Holiness was elected president of the WCC (World Council of Churches) (1991-1998) and for 3 consecutive terms of the MECC (Middle East Council of Churches) (1994-2007). Pope Shenouda hosted the first meeting of Heads of Oriental Orthodox Churches of the Middle East in 1998 and a standing committee was established to follow up the meetings. His Holiness always emphasizes that Christian unity must be built on unity of faith not jurisdiction. The depth of the monastic life as evident in the life of the ascetic Pope has been reflected in the monastic revival initiated by His Holiness over the last forty years. The number of monasteries in Egypt increased from 9 in 1971 to 26 in 2009. Abroad there are monasteries in America (2), Australia (2), Europe (2), South Africa (1), Kenya (1), Sudan (2) and Jerusalem (1). Every week His Holiness retired to the Monastery of St. Bishoy for a three-day retreat, reflection and then returned to enlighten and nourish his flock. A man of prayer and meditation, Pope Shenouda was an authentic monk who radiates joy and peace to all who come into contact with him. Upon succeeding to the See of St. Mark, His Holiness became the first Patriarch of Alexandria since the 5th Century to have been Dean of the Theological College. His Holiness continually lectured at the branches of the College in Cairo and Alexandria, and at the Higher Institute of Coptic Studies. Owing to His Holiness’ personal attention, the College has expanded and enlarged. His Holiness established 8 branches of the College in Egypt and 6 in the Diaspora (3 in the USA, 2 in Australia and 2 in Europe). His Holiness also established the Institute of Pastoral Affairs in 1993. He ordained 117 Bishops and 2 Eritrean Patriarchs (Abouna Philopos in May 1998 and Abouna Antonious in May 2002). His Holiness ordained over 1000 priests for Egypt and abroad, as well as over 800 monks and nuns. His Holiness also ordained over 150 consecrated sisters and deaconesses to assist Bishops and priests in their vast ministry. To address youth issues and concerns His Holiness ordained His Grace Bishop Moussa as the first Bishop of Youth Affairs in May 1980. As a result of the unprecedented increase in the geographical expansion of the Coptic Orthodox Church, His Holiness performed the Mystery of the Sanctification of the Holy Myron (Chrism) seven times in the Monastery of St. Bishoy in the years 1981, 1987, 1993, 1995, 2005, 2008 and in September 2004 in Eretria. When His Holiness Pope Shenouda III was enthroned, there were only seven Coptic Churches outside of Egypt: two each in Canada, the USA and Australia and one in England. Despite his numerous commitments, His Holiness took direct responsibility for the pastoral care of the growing number of Coptic Churches in the Diaspora. As a result of His Holiness’ tireless efforts, the Churches in the Diaspora grew and flourished in a remarkable way. From 1990 and onwards, His Holiness sent Christmas and Easter pastoral messages to the flock abroad and in May 1992 His Holiness initiated an English version of El Keraza to serve and reach the second and third generations of Copts abroad. His Holiness established hundreds of Churches and 15 dioceses outside Egypt and instructed the Bishops and priests to take particular care of children and youth ministry. His Holiness encouraged the establishment of schools. Today there are 5 Coptic Schools in Australia, 3 in Canada and 2 in the USA. In order to respond adequately to the needs of the Copts abroad, to bring Churches in the Diaspora together and to relate them individually and collectively as a unified whole to the Mother Church, His Holiness Pope Shenouda III made many pastoral visits to Europe, USA, Canada, Australia, Africa and Latin America. To date, Pope Shenouda undertook 84 trips to 37 different countries. During his visits, Pope Shenouda prayed liturgies, consecrated altars, laid foundation stones, ordained priests and deacons, and baptized children. His Holiness also conducted pastoral meetings with priests, met with religious and civic leaders, held press conferences and delivered homilies and sermons. As Head of the oldest Church in Africa, His Holiness Pope Shenouda III was very keen to extend the Apostolic Mission of St. Mark across all Africa. In June, 1976 His Holiness ordained Bishop Antonius Markos to consolidate missionary work among the African tribes of Kenya. In 1995, His Holiness ordained Bishop Paul to assist in this vast field in Africa. In 2006 His Holiness ordained Bishop Agathon and Bishop Youssef, the former for Brazil and the later Bolivia, to undertake missionary work in Latin America. 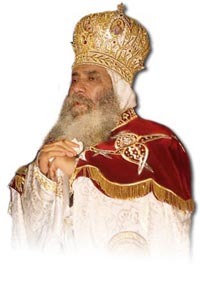 His Holiness Pope Shenouda III has steadfastly worked to secure peace between all Egyptians, Copts and Muslims. His Holiness says, “Egypt is not a country in which we live but rather a country which lives in us.” In recognition of his efforts Pope Shenouda was awarded the UNESCO prize for the Promotion of Tolerance and Non-violence on 16th November 2000. UNESCO’s Director General praised his Holiness for promoting exchange and understanding between Christianity and Islam in the Middle East. As we honor His Holiness, we glorify and praise God who gave His Holiness grace, strength and wisdom to serve the Church. Nonetheless, we know His Holiness’ “honor is not from men but from God.” (Romans 2:29). As Daniel the prophet says, “Those who are wise shall shine like the brightness of the firmament, and those who turn many to righteousness like the stars forever and ever.” (Daniel 12:3). His Holiness continued his relentless efforts to preach and teach the Coptic people and others who were attracted to his simple and powerful approach of teaching the Holy Bible and church dogma, as well as all aspects of Christian living. We all recognize today that His Holiness Pope Shenouda is a school in himself and a phenomenon that occurs only once in many generations. Many consider him to be a new St. Paul the Apostle in his preaching, St. Athanasius the Apostolic in his defense of Orthodoxy, St. John Chrysostom in his ability to deliver golden words of spirituality, and St. Shenouda the Archimandrite in his monasticism, prayer, and life of solitude. 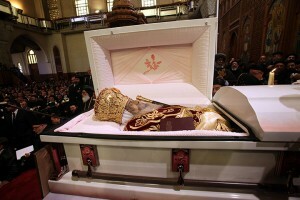 His Holiness Pope Shenouda reposed in the Lord on March 17, 2012 after more than forty years as the Pope and Patriarch of the Coptic Orthodox Church. Under his guidance, the Coptic Church flourished and saw an age of spiritual revival. He was laid to rest in the Monastery of St. Pishoy in Wadi-el-Natroun. We pray that the Lord may repose the soul of His Holiness Pope Shenouda III in the Paradise of Joy, in the bosom of our fathers Abraham, Isaac, and Jacob, in the choirs of the martyrs, crossbearers, and saints who pleased God from Adam to the end of the ages. May his holy blessings be with us all. Amen.